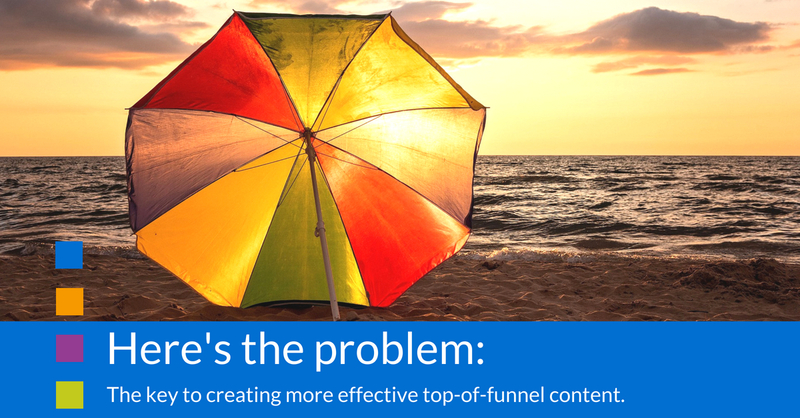 Want more effective top-of-funnel content? Start looking for problems. It’s no secret that one of the biggest marketing challenges is to warm up cold prospects. Give someone the chance to leap out of the top of the sales funnel, and you may never see them again. That’s why at the top-of-funnel (ToFu) — you might call it the awareness or discovery stage — the key to getting the sales conversation started is to give people a reason to care. Want to sell more umbrellas in a heat wave? Let people know it’s going to rain. You want to sell more umbrellas but temperatures are soaring, and your potential buyers are too busy clearing the shelves of sun cream, beach toys and BBQ supplies to pay you any attention. Meanwhile, you’re tracking the storm that’s heading in their direction. But it’s not enough for you to know what’s up with the jet stream. To start selling, you need to make your audience aware too. If not, your attempts to get the conversation flowing are only going to be met with cries that you’re blocking the sun. This is the job of effective top-of-funnel content: to let those sun-worshippers know the downside of doing nothing, raise awareness of the problem that your solution solves, and get people talking. What if they already know about the storm? Now, what about those who have seen the forecast and plan to take shelter under the nearest tree? For these people, the problem is not that a storm is coming; it’s that their current solution is not as effective as it could be. And it could be downright dangerous if the forecast includes lightning. In mature industries, where organisations are aware of the problem and already have a solution, your ToFu content must highlight the shortfalls of those incumbent solutions. To increase the effectiveness of your top-of-funnel content, make sure you’re raising awareness of the problem your solution solves. If your readers are not aware of the problem, highlight it; if your audience already have a solution, point out where it falls short compared to yours. Click the button to recieve more actionable advice on fuelling better conversations with your audience, straight to your inbox.